To Cite: Sadighpour M, Ramezani Farani A, Gharraee B, Lotfi M. Dynamic Infrastructures of Body Dysmorphic Disorder Symptoms: A Structural Equation Model, Iran J Psychiatry Behav Sci. 2019 ; 13(1):e61508. doi: 10.5812/ijpbs.61508. Objectives: The aim of the current study was to propose a model for body dissatisfaction, body comparison and internalization of appearance-related ideals as mediators of self-esteem, multidimensional perfectionism, perception of teasing, and perceived sociocultural pressures of body dysmorphic disorder symptoms. Methods: This was a correlational study performed via structural equation modeling. The statistical population of the study consisted of 802 university students who were chosen via the multilevel cluster sampling method. The data collection tools included Yale-Brown obsessive-compulsive scale modified for body dysmorphic disorder, multidimensional body-self relations questionnaire, and Rosenberg self-esteem, multidimensional perfectionism, sociocultural attitudes towards appearance, body comparison, perception of teasing and perceived sociocultural pressure scales. For data analysis, structural equation modeling was used via Lisrel 8.5 software. Results: Although the initial model was a poor fit to the data, the fit was improved after some modifications were made. There were some differences between the male and female models, but body dissatisfaction maintained a mediator role with respect to self-esteem and perceived sociocultural pressures of body dysmorphic disorder symptoms in both genders. Conclusions: Findings of the current study proposed a comprehensive model regarding understanding of the structural interactions of various psychosocial factors of body dysmorphic disorder symptoms. Comprehending dynamics of the aforementioned factors is essential both in interventional and prophylactic approaches. According to the diagnostic and statistical manual of mental disorders, fifth edition (DSM-5), body dysmorphic disorder (BDD) is a preoccupation with an “imagined” defect in one’s appearance, and in case of a slight physical anomaly, the person’s concern is significantly excessive. The preoccupation is associated with many time-consuming rituals such as mirror gazing or constant comparing (1). BDD is a multifactorial problem (i.e., biological, psychological and sociocultural) (2); however, data regarding its exact etiology are sparse and few studies have examined this area precisely (3). BDD patients tend to have a distorted and unrealistic body image (1), and it has been found that lower body image satisfaction correlates with higher levels of BDD (4). According to Hrabosky et al. (5), in both groups of eating disorders and BDD, there is a significant distortion in various aspects of body image. Nevertheless, BDD patients demonstrate more acute features in comparison with eating disorders (5). Throughout the last decade, there has been a growing trend regarding the development and assessment of comprehensive models related to factors contributing to body dissatisfaction; one of these models is that of Thompson et al. (6). According to this model, the relationship of media, family and friend’s appearance-related pressures with body image and eating-related distress is mediated by the internalization of appearance-related ideals (IARI) and body comparison (7). Individual differences in the frequency of body comparison are one of the predictive factors of body dissatisfaction; frequent comparison with models and attractive friends would boost this dissatisfaction (8). Body comparison is a mediator variable interconnected with variables such as self-esteem (SE), perceived sociocultural pressures (PSP) and body dissatisfaction (9). IARI is one of the prominent contributing factors of body dissatisfaction since most of these ideals are too remote for most people (10). Various studies postulate that internalization maintains a mediating role with respect to body dissatisfaction, personal (lucid concept of self) variables and social (media, friends and parents) pressures (11-13). Personality traits and psychological process are interconnected via IARI, body comparison and body dissatisfaction. Teenage girls with low self-esteem are vulnerable to accepting social standards as an index for self-assessment and body comparison (14). According to Rodgers et al. (7), SE has a relationship with body image concerns via the mediating roles of IARI and body comparison. Another important personality trait that plays a role in body dissatisfaction is perfectionism. Increased level of perfectionism would lead to self-value assessment of oneself based on socially-accepted aesthetic standards (15). Perfectionism increases the level of internalization, and it is indirectly linked with body dissatisfaction via IARI (16). Perception of appearance-related teasing is about negative assessment, direct mocking and vague jokes of others regarding one’s physical appearance (17). Negative social feedbacks in the form of teasing related to appearance are discussed as a probable etiological factor of body image distortion (6). 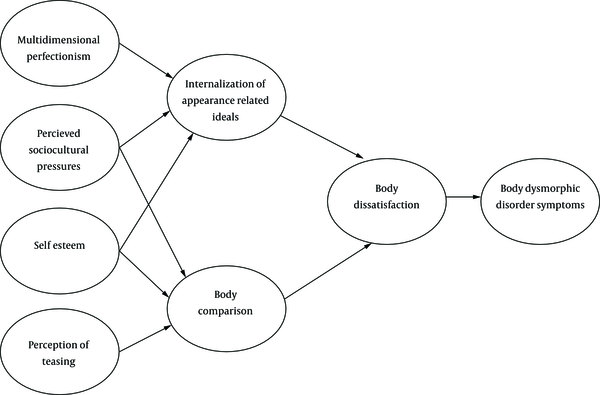 Structural equation modeling approaches show that the relationship between appearance-related teasing and problematic body image is mediated by various factors. As such, according to Rodgers et al. (7), body comparison is a mediator variable in relation to perception of teasing (POT) and body image concerns. Perceived sociocultural pressures are related to sociocultural pressures induced by family, friends and society, and in turn, endeavors to modify appearance according to their comments and belief system (18). Although numerous individuals are dealing with these sources of pressure, not all of them experience body dissatisfaction. Hence, it is probable that the relationship between PSP and body dissatisfaction is mediated via other psychological variables. One of the variables worth mentioning is internalization. It has been postulated that internalization predicts the level of body dissatisfaction. Thus, confrontation cannot justify the incidence of BDD, but it could be related to the level of internalization of media-induced aesthetic ideals (19). Furthermore, influenced by sociocultural pressure, individuals tend to compare their appearance with others, such as friends and media models. This increase in body comparison would lead to concerns regarding body image (7). 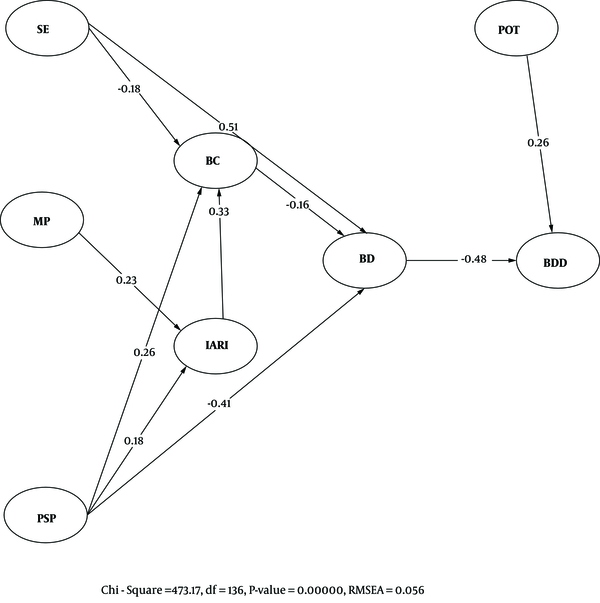 Based on the aforementioned information, in this study a model was proposed to investigate the complex relationship between all of these variables regarding BDD symptoms (Figure 1). Most cross-sectional studies on models and contributing factors related to body image were conducted among statistical samples consisting of women. In the initial premise, it was discussed that similar variables can define body image dissatisfaction in both genders. However, recent studies postulate that there are substantial differences between the two genders (20). Accordingly, one of the aims of the current study was to assess and compare the current models between male and female participants. In the current study, the authors aimed to propose a model regarding body dissatisfaction, body comparison and internalization of appearance-related ideals (IARI) as mediators of self-esteem (SE), multidimensional perfectionism (MP), perception of teasing (POT) and perceived sociocultural pressures (PSP) of BDD symptoms in both genders. The purpose of the current study was to shed light on various factors underlying this malady, and hopefully, with understanding of the somewhat complex dynamic of these factors, clinicians can come up with more accurate tailored clinical plan. The current correlational study was performed via structural equation modeling. The statistical population consisted of 802 bachelor’s degree students, who were chosen by the multilevel cluster sampling method from five various universities in Tehran, Iran. The participants were excluded if they were preoccupied with their weight or any form of eating disorder was suspected. The data collection tools included Yale-Brown obsessive-compulsive scale modified for body dysmorphic disorder (Y-BOCS-BDD), multidimensional body-self relations questionnaire (MBSRQ), Rosenberg self-esteem scale (RSES), multi perfectionism scale (MPS), sociocultural attitudes toward appearance scale-3 (SATAQ-3), body comparison scale (BCS), perception of teasing scale (POTS) and perceived sociocultural pressure scale (PSPS). Data were collected from September, 2016 to February, 2017. With respect to data analysis, structural equation modeling was used. Model fit was assessed using Bentler’s comparative fit index (CFI), the goodness of fit index (GFI), the root mean square error of approximation (RMSEA) and chi-square test. This scale consists of the two subscales of obsessions and compulsions and two additional questions that assess insight and avoidance. Each item is rated based on a Likert scale from 0 (completely disagree) to 4 (completely agree). Phillips et al. (21) examined the psychometric properties of BDD-YBOCS’s and showed that the internal consistency of this scale was strong and the scale had good convergent and discriminant validity. The standardization of the Persian version of this scale among Iranian students showed that this scale had a good validity and reliability, Cronbach’s alpha was 0.93 (22). In the current study, 10 questions of the questionnaire were used, and questions 11 and 12 were eliminated. These modifications were in accordance with a study conducted by Goodman et al. (23). The 10 questions were validated among 401 participants (18 - 62 years old) and showed to have satisfactory validity (Cronbach’s alpha = 0.76) (24). This is a 34-item measure that consists of five subscales including appearance evaluation, appearance orientation, overweight preoccupation, self-classified weight, and body areas satisfaction. Each item of the questionnaire is rated based on a 5-point Likert scale (25). Both the main factor and additional subscales of the MBSRQ-AS had good psychometric properties with reported internal consistency coefficients ranging from 0.70 to 0.89 and one-month test-retest reliability ranging from 0.74 to 0.89 (26). For studying the Persian version of this questionnaire, an investigation was conducted among 217 students, which showed acceptable test-retest reliability with a two-week interval. That study also reported that the Cronbach’s alpha coefficients were good for all the subscales (27). In this study, to examine body dissatisfaction, appearance evaluation and body areas satisfaction subscales were used. This is a tool for assessing global SE. Ten statements pertaining to self-worth and self-acceptance are included in the self-report measure. Each item is rated based on a Likert scale ranging from 1 (completely disagree) to 4 (completely agree). The Rosenberg self-esteem scale presented high ratings in reliability areas: internal consistency was 0.77 and minimum coefficient of reproducibility was at least 0.90. A varied selection of independent studies, each using samples such as parents, men over 60 years of age, high school students and civil servants, showed alpha coefficients ranging from 0.72 to 0.87 (all fairly high). Test-retest reliability with a two-week interval was calculated as 0.85, and with a seven-month interval it was calculated as 0.63 (28). Among Iranian university students, the reliability of this scale was estimated using Cronbach’s alpha (0.69), test-retest (0.78), and Spearman-Brown’s split half (0.68) formulas. The reliability and validity of the Persian version of this scale were moderate (29). Hewitt and Flett in 1991 developed MPS with the three subscales of self-oriented, other-oriented and socially-prescribed perfectionism. This scale has 30 items each evaluated based on a 5-point Likert scale (30). MPS has an acceptable reliability and validity (31). Based on Besharat’s (32) study of the psychometric properties of the Persian version of MPS, test-retest reliability and internal consistency of this scale are satisfactory. In the present study, with regards to the literature, self-oriented and socially-prescribed subscales were used. This questionnaire measures one’s endorsement of societal appearance ideals, and consists of 30 items and the four subscales of internalization-general, information, pressures and internalization-athlete. Each item in this questionnaire is evaluated by a 5-point Likert scale. Each subscale had an acceptable Cronbach’s alpha coefficient (information (0.96), pressures (0.92), internalization-general (0.96) and internalization-athlete (0.95)). The SATAQ-3 subscales had excellent convergent validity with measures of body image and eating disturbance (33). Findings of Mohammadpanah Ardakan et al. (34) confirmed the appropriate validity and reliability of the Persian version of SATAQ-3. In the present study, for the assessment of IARI, the internalization-general subscale was used. This is a 25-item self-assessment scale, which compares various body parts. Individuals are asked about the interval they tend to compare their body parts with others. The items are answered based on a 5-point Likert scale. BCS consists of the four subscales of general appearance, weight scale, muscular scale, and non-weight non-muscular scale (35). According to van den Berg et al. (36), BCS maintains high internal consistency (Cronbach’s alpha = 0.91). In the present study, the internal consistency of the Persian version of this scale was appropriate. Weight scale was omitted in the current study due to the current design objectives. The POTS is an 11-item scale consisting of the two subscales of general weight teasing and competency teasing. Each item is evaluated by a 5-point Likert scale. The scale has established reliability and validity. The alpha for general weight teasing was 0.94, and for competency teasing it was 0.78 (37). In a study conducted by Buhlmann et al. (38), some modifications were made in order to assess the general concerns related to appearance (instead of concerns regarding weight). In the aforementioned study, internal consistency of this scale was between 0.77 and 0.88. In the current study, in order to assess perception of teasing related to appearance, some modifications were made to the subscale of general weight teasing. In order to assess the content validity of the modified scale, five professors from Iran University of Medical Sciences assessed this scale, and subsequently, the modified scale was assessed among a sample of 100 students; Cronbach’s alpha was reported to be 0.90 in the aforementioned study. This scale that was designed by Stice and Bearman (39) and consists of 10 questions, which assess the level of perceived pressure from friends, family, media and dating partner. The items are rated via a 5-point Likert scale. In a study conducted by Garrusi et al. (40), the Persian version of the perceived socio-cultural pressure scale was designed, the internal and inter-item consistency of which was satisfactory. Construct and criterion validity of the scale was also acceptable. In the current scale, in order to assess perceived pressure related to appearance, some modifications were made. In order to assess content validity, five professors of psychology from Iran University of Medical Sciences assessed the scale. Subsequently, their comments were implemented in the questionnaire. Assessment of Cronbach’s alpha among 100 participants showed that the questionnaire maintained satisfactory reliability (Cronbach’s alpha = 0.85). Due to the cultural/religious beliefs of most students, they were reluctant to reply to questions regarding dating partner, hence those questions were omitted. This scale is the gold standard approach to the assessment of BDD, which has four Yes/No questions. In a study conducted by Brohede et al. (41), the BDDQ showed good concurrent validity, with a sensitivity of 94%, a specificity of 90% and a likelihood ratio of 9.4. In this study, the last question of this questionnaire: “Is your main concern about your appearance that you are not thin enough or that you might become fat?” was used. This was used to exclude people mainly concerned about not being thin enough, in order not to over diagnose BDD symptoms when an eating concern is a more correct diagnosis (42). Subsequently, the obtained data were assessed via SPSS version 18; furthermore, structural equations of the variables were assessed via Lisrel 8.5. To comply with the principles of the professional ethics, a code of ethics (IR.IUMS.REC1395.9311556006) was received from the Research Ethics Committee of Iran University of Medical Sciences. Also, after explaining the purpose of the study and the privacy issues, the participants provided an informed consent prior to participation in the study. Overall, 1057 students accepted to take part in the study. Among this number of students, 241 answered yes to the screening question so only 816 participants completed the scales. Also, 14 participants answered to the scales incompletely; thus, the information of 802 participants was analyzed. Furthermore, 62.3% (500) of the samples were female and 37.7% (302) were male. The mean age of the participant was 20.79 ± 2.10 years. Descriptive statistics and inter-variable correlations are shown in Table 1. Abbreviations: BC, body comparison; BD, body dissatisfaction; BDD, body dysmorphic disorder; IARI, internalization of appearance-related ideals; MP, multidimensional perfectionism; POT, perception of teasing; PSP, perceived sociocultural pressures; SE, self-esteem. a All correlations are significant at P < 0.01. With regards to the cut-off score of 16 in BDD-YBOCS, 21.6% of the participants had symptoms of BDD. After investigating univariate and multivariate normality and multicollinearity assumption by using the correlation matrix and understanding that normality and multicollinearity would not be a problem, the hypothetical model was tested using structural equation modeling. Assessment of hypothetical model showed weak fitness of the model (X2 (137) = 919.94, P = 0.00, CFI = 0.94, GFI = 0.89, RMSEA = 0.08). However, assessment of modified indices showed that by adding the relationship between SE and BD, IARI and BC and including the relationship between POT and BDD symptoms, the proposed model would be enhanced dramatically. As these pathways were supported by the literature, they were added to the initial model. In addition, the non-significant pathways between POT and BC, SE and IARI and between IARI and BD were omitted. After implementing these changes, the model maintained satisfying fitness (X2 (136) = 473.17, P = 0.00, RMSEA = 0.05, CFI = 0.98, GFI = 0.94). a Standardized indirect effects are statistically significant at P < 0.05. Assessment of the hypothetical model for both genders separately showed weak fitness of the model. However, by considering the modified indices in the females’ model, the modifications that were added to the general model were also added to the females’ model. Also, in this model, unlike the general model, including the direct relationship between MP and BDD enhanced the model fitness (X2 (135) = 318.40, P = 0.00, RMSEA = 0.05, CFI = 0.98, GFI = 0.94). Modified indices in the model for male samples showed that by including the relationship between MP and BDD, IARI and BC, SE and BD, and PSP and BD the model fitness would be enhanced. Considering the literature, these modifications were added to the males’ model. In addition, the non-significant pathways between PSP and IARI, PSP and BC, SE and internalization and between internalization and BD were omitted. These modifications enhanced the model fitness (X2 (137) = 251.37, P = 0.00, RMSEA = 0.05, CFI = 0.97, GFI = 0.92). Our search of the literature did not yield any similar studies on BDD. In the current study, we shed light on various variables underlying BDD and delineated the complex relationship between these variables and BDD symptoms. Our aim was to propose a model regarding body dissatisfaction, body comparison and IARI as mediators of SE, MP, POT and PSP of BDD symptoms. About self-esteem, firstly, there was a significant negative relationship between SE and BC in the general model and in both genders. This relationship, which is consistent with other studies (7, 9, 43), shows that people with low SE are vulnerable to self-assessment through body comparison. Most women put great importance on their physical image and physical attractiveness and see it as a basis for evaluating their own value. People who value themselves on the basis of external standards are more likely to evaluate themselves through others, which can be done in the form of body comparison (43). Secondly, there was a direct relationship between SE and body dissatisfaction in the general model and in both genders. This direct relationship was consistent with the results of previous studies (12, 42, 44). In Sheffield et al.’s (45) study the relationship between SE and body dissatisfaction among women from Hong Kong and Australia was assessed; SE was not a significant predictor of body dissatisfaction among participants. In a study that was conducted by Francisco et al. (20) low SE significantly predicted body dissatisfaction among Spanish teenagers, but this relationship was not observed among Portuguese teenagers. These studies highlighted the important role of culture in body image. Thirdly, body dissatisfaction was a mediator of the relationship between SE and BDD in the general model and in both genders. Although there is no study that has investigated this indirect relationship, some studies (4, 5) have shown that by increasing the level of body dissatisfaction, people become more susceptible to BDD, and this disorder’s symptoms become more severe. Disturbance in cognitive, behavioral and emotional aspects of body image is considered as a core concept in BDD pathology (46). By considering this information and the relationship between SE and body dissatisfaction, this indirect relationship can be justified. Regrading PSP, firstly, it was a significant predictor of BC and IARI in the general and female models. This finding that is consistent with the results of other studies (7, 13, 36, 47) shows that by increasing perceived pressures from parents, friends and media, the level of body comparison and IARI will increase. These relationships are based on the tripartite model (6). This model suggests that three effective variables, including friends, parents and media, are the basis of body image and eating disorders, the relationship between which is mediated by internalization and body comparison (36). When people are faced with pressures from these three sources, they develop negative views toward themselves and accept prescriptive ideals as their own, and one way of obtaining these ideals is through body comparison. Pressure induced by media maintains a higher influence (as compared to family and friends) on IARI (13). Furthermore, appearance-related standards induced by media among women are more strict, congruent and remote than those of men (48). This can justify the lack of IARI role in relation with PSP among men. Secondly, results demonstrated that PSP is directly predictive of BD in general and in the models of both genders. The existing relationship between PSP and BD is consistent with the results of other studies (13, 49). This direct relationship shows that PSP can directly induce negative body perception without involving IARI or body comparison. Thirdly, body dissatisfaction had a mediating role in the relationship between PSP and BDD. Although there is no study that has investigated this relationship, by considering the relationship between PSP and BD and between BD and BDD, this mediating role can be justified. The modified model in general and among women showed that POT is directly associated with BDD symptoms. These results are in contrast to the results of some previous studies (7, 43, 50). Some differences were observed in measurement tools and age of participants. The relationship between POT and BDD was delineated in studies conducted by Weingarden and Renshaw (51) and Buhlmann et al. (38). These studies reported that POT is an important contributing factor to the incidence of BDD symptoms and it is related to the severity of symptoms. Patients may justify their POT experiences as a proof of existing problems in their appearance. However, in the male model as hypothesized in the general model, there was a significant relationship between POT and body comparison. This result is consistent with the results of other investigations (7, 43, 50) that indicated people who have received negative feedbacks about their appearance are more likely to compare different parts of their body with others. Any attention to appearance from others, especially appearance-related teasing, shifts people’s attention to their bodies and prones them to body comparison. If a person receives negative messages about his appearance, he may internalize these messages and in order to find out how he should look, compares his body with peers (50). This difference between males and females can be due to women’s higher sensitivity to negative feedbacks about appearance that directly leads to BDD symptoms. As to perfectionism, there was a significant positive relationship between MP and IARI in the general model and in both genders. This finding that is consistent with other studies (16, 20) shows that by increasing the level of perfectionism, people become more vulnerable to internalizing ideals of the society. Perfectionists set high standards for their performance in different areas of life. Accepting beauty standards can be a sign of their general desire to accept high standards (16). Furthermore, in the modified model among men and women, there was a direct relationship between perfectionism and BDD symptoms. This result is consistent with those of studies conducted by Hartmann et al. (52) and Buhlmann et al. (53). Individuals with BDD tend to possess maladaptive thoughts regarding their attractiveness. Indeed, high level of perfectionism may make BDD patients to excessively focus on their imperfect appearance. This finding is consistent with the results of Higgins (54) who postulated that difference between the real self and ideal self may lead to negative emotions. These patients experience meaningful dissimilarities between their real and ideal selves. In the current study, a significant positive relationship was observed between IARI and body comparison in the general model and in both genders. Fitzsimmons-Craft et al. (55) confirmed this relationship. However, in the study conducted by Karazsia and Crowther (47), internalization had a mediating role between body dissatisfaction and body comparison, although body comparison was considered directly related to body dissatisfaction. According to Durkin et al. (14), with exposure to the ideal image, IARI indirectly leads to the modification of body satisfaction via body comparison. Indeed, IARI is accompanied by body comparison and this negative comparison has negative influence on body satisfaction of individuals. According to these results, individuals tend to internalize aesthetic standards of the society and body comparison is formed in accordance with the aforementioned standards. Furthermore, body dissatisfaction tends to increase, while individuals tend to experience high levels of difference between their ideal self-image and their actual appearance. The existence of a significant positive relationship between body comparison and body dissatisfaction is consistent with the findings of other studies (7-9, 43, 47) and shows that by increasing body comparison, the level of body dissatisfaction will increase. Body comparison and attention to cultural standards are the means by which people evaluate their body. As a result of this comparison, the perception of the discrepancy between self and ideals increases, ultimately leading to body dissatisfaction (7). Comprehending dynamics of the aforementioned factors is essential both in interventional and prophylactic approaches; for instance, as has been mentioned, the media have a significant effect on BDD symptoms. Therefore, the content of the media should honor the appearance differences and remind the relativity of beauty. This problem can also be reduced by increasing parents’ awareness about the effect of their words on their child’s body satisfaction. It is recommended to conduct same design studies among other sociocultural statistical samples. Generalization of the proposed model may be subject to reconsideration because sociocultural variations can dramatically affect the complex dynamic of BDD symptoms. This study has some limitations. The first limitation is the cross-sectional nature of the design that prevents us from causative conclusions. Secondly, as the study samples are limited to bachelor’s degree students; thus, the results cannot be generalized to other groups. In this study, as there were no subjects with a definitive diagnosis of BDD, replication of this study in these patients is needed. Also, because of the limited literature on the mediating role of body comparison in the relationship between IARI and body dissatisfaction, further studies are needed to examine this relationship. Authors' Contribution: Maryam Sadighpour collected the clinical data and drafted the manuscript. Maryam Sadighpour, Abbas Ramezani Farani and Banafsheh Gharraee conceived and designed the study and interpreted the clinical data. Maryam Sadighpour and Mozhgan Lotfi performed the statistical analyses. All the authors revised the manuscript critically and approved the final manuscript. Clinical Trial Registration Code: None declared. Declaration of Interest: Authors have no financial interests related to the material in the manuscript. Ethical Approval: To comply with the principles of the professional ethics, a code of ethics (IR.IUMS.REC1395.9311556006) was received from the Research Ethics Committee of Iran University of Medical Sciences. Also, after explaining the purpose of the study and the privacy issues, informed consent was obtained from the participants. Funding/Support: This study was supported in part by Iran University of Medical Sciences. 1. Veale D. Body dysmorphic disorder. Postgrad Med J. 2004;80(940):67-71. [PubMed: 14970291]. [PubMed Central: PMC1742928]. 2. Phillips KA. The broken mirror: Understanding and treating body dysmorphic disorder. New York: Oxford University Press; 1996. 3. Feusner JD, Yaryura-Tobias J, Saxena S. The pathophysiology of body dysmorphic disorder. Body Image. 2008;5(1):3-12. doi: 10.1016/j.bodyim.2007.11.002. [PubMed: 18314401]. [PubMed Central: PMC3836287]. 4. Didie ER, Kuniega-Pietrzak T, Phillips KA. Body image in patients with body dysmorphic disorder: Evaluations of and investment in appearance, health/illness, and fitness. Body Image. 2010;7(1):66-9. doi: 10.1016/j.bodyim.2009.09.007. [PubMed: 19942488]. 5. Hrabosky JI, Cash TF, Veale D, Neziroglu F, Soll EA, Garner DM, et al. Multidimensional body image comparisons among patients with eating disorders, body dysmorphic disorder, and clinical controls: A multisite study. Body Image. 2009;6(3):155-63. doi: 10.1016/j.bodyim.2009.03.001. [PubMed: 19410528]. 6. Thompson JK, Coovert MD, Stormer SM. Body image, social comparison, and eating disturbance: A covariance structure modeling investigation. Int J Eat Disord. 1999;26(1):43-51. [PubMed: 10349583]. 7. Rodgers RF, Paxton SJ, McLean SA. A biopsychosocial model of body image concerns and disordered eating in early adolescent girls. J Youth Adolesc. 2014;43(5):814-23. doi: 10.1007/s10964-013-0013-7. [PubMed: 24014348]. 8. Cattarin JA, Thompson JK, Thomas C, Williams R. Body image, mood, and televised images of attractiveness: The role of social comparison. J Soc Clin Psychol. 2000;19(2):220-39. doi: 10.1521/jscp.2000.19.2.220. 9. van den Berg P, Paxton SJ, Keery H, Wall M, Guo J, Neumark-Sztainer D. Body dissatisfaction and body comparison with media images in males and females. Body Image. 2007;4(3):257-68. doi: 10.1016/j.bodyim.2007.04.003. [PubMed: 18089272]. 10. Thompson JK, Stice E. Thin-ideal internalization: Mounting evidence for a new risk factor for body-image disturbance and eating pathology. Curr Dir Psychol Sci. 2016;10(5):181-3. doi: 10.1111/1467-8721.00144. 11. Vartanian LR, Froreich FV, Smyth JM. A serial mediation model testing early adversity, self-concept clarity, and thin-ideal internalization as predictors of body dissatisfaction. Body Image. 2016;19:98-103. doi: 10.1016/j.bodyim.2016.08.013. [PubMed: 27643889]. 12. Fingeret MC, Gleaves DH. Sociocultural, feminist, and psychological influences on women's body satisfaction: A structural modeling analysis. Psychol Women Quart. 2016;28(4):370-80. doi: 10.1111/j.1471-6402.2004.00154.x. 13. Shin K, You S, Kim E. Sociocultural pressure, internalization, BMI, exercise, and body dissatisfaction in Korean female college students. J Health Psychol. 2017;22(13):1712-20. doi: 10.1177/1359105316634450. [PubMed: 26936503]. 14. Durkin SJ, Paxton SJ, Sorbello M. An integrative model of the impact of exposure to idealized female images on adolescent girls? Body satisfaction. J Appl Soc Psychol. 2007;37(5):1092-117. doi: 10.1111/j.1559-1816.2007.00201.x. 15. Cash TF. Cognitive-behavioral perspectives on body image. In: Cash TF, Pruzinsky T, editors. Body image: A handbook of theory, research and clinical practice. New York: Guilford Press; 2002. p. 38-46. 16. Boone L, Soenens B, Braet C. Perfectionism, body dissatisfaction, and bulimic symptoms: The intervening role of perceived pressure to be thin and thin ideal internalization. J Soc Clin Psychol. 2011;30(10):1043-68. doi: 10.1521/jscp.2011.30.10.1043. 17. Keltner D, Capps L, Kring AM, Young RC, Heerey EA. Just teasing: A conceptual analysis and empirical review. Psychol Bull. 2001;127(2):229-48. [PubMed: 11316012]. 18. Helfert S, Warschburger P. A prospective study on the impact of peer and parental pressure on body dissatisfaction in adolescent girls and boys. Body Image. 2011;8(2):101-9. doi: 10.1016/j.bodyim.2011.01.004. [PubMed: 21354379]. 19. Blowers LC, Loxton NJ, Grady-Flesser M, Occhipinti S, Dawe S. The relationship between sociocultural pressure to be thin and body dissatisfaction in preadolescent girls. Eat Behav. 2003;4(3):229-44. doi: 10.1016/S1471-0153(03)00018-7. [PubMed: 15000967]. 20. Francisco R, Espinoza P, Gonzalez ML, Penelo E, Mora M, Roses R, et al. Body dissatisfaction and disordered eating among Portuguese and Spanish adolescents: The role of individual characteristics and internalisation of sociocultural ideals. J Adolesc. 2015;41:7-16. doi: 10.1016/j.adolescence.2015.02.004. [PubMed: 25754193]. 21. Phillips KA, Hart AS, Menard W. Psychometric evaluation of the Yale-Brown obsessive-compulsive scale modified for body dysmorphic disorder (BDD-YBOCS). J Clin Psychiatry. 2001;62(2):87-91. [PubMed: 11247107]. [PubMed Central: PMC4096700]. 22. Rabiee M, Khorramdel K, Kalantari M, Molavi H. [Factor structure, validity and reliability of modified Yale-Brown obsessive compulsive scale for body dysmorphic disorder in students]. Iran J Psych Clin Psychol. 2010;5(4):343-50. Persian. 23. Goodman WK, Price LH, Rasmussen SA, Mazure C, Fleischmann RL, Hill CL, et al. The Yale-Brown obsessive compulsive scale. I. Development, use, and reliability. Arch Gen Psychiatry. 1989;46(11):1006-11. [PubMed: 2684084]. 24. Marques L, LeBlanc N, Weingarden H, Greenberg JL, Traeger LN, Keshaviah A, et al. Body dysmorphic symptoms: Phenomenology and ethnicity. Body Image. 2011;8(2):163-7. doi: 10.1016/j.bodyim.2010.12.006. [PubMed: 21354876]. 25. Cash TF. Body image assessments: MBSRQ. 2012, [updated 2017]. Available from: http://www.body-images.com/assessments/mbsrq.html. 26. Argyrides M, Kkeli N. Multidimensional body-self relations questionnaire-appearance scales: Psychometric properties of the Greek version. Psychol Rep. 2013;113(3):885-97. doi: 10.2466/03.07.PR0.113x29z6. [PubMed: 24693817]. 27. Sadeghi KH, Gharraee B, Fata L, Mazhari S. [Effectiveness of cognitive-behavioral therapy in treating patients with obesity]. Iran J Psych Clin Psychol. 2010;16(2):107-17. Persian. 28. Rosenberg M. Rosenberg self-esteem scale (SES). 2014, [updated 2017]. Available from: http://www.statisticssolutions.com/rosenberg-self-esteem-scale-ses/. 29. Mohammadi N. [The preliminary study of validity and reliability of rosenberg's self-esteem scale]. J Iran Psychol. 2005;1(4). Persian. 30. Hewitt PL, Flett GL. Perfectionism in the self and social contexts: Conceptualization, assessment, and association with psychopathology. J Pers Soc Psychol. 1991;60(3):456-70. [PubMed: 2027080]. 31. Aminizadeh S, Dolatshahi B, Pourshahbaz A, Babapour B, Yousefzadeh I, Zamanshoar E, et al. Psychometric properties of multidimensional perfectionism scale (MPS). Pract Clin Psychol. 2013;1(4). 32. Besharat MA. [Exploratory analysis of the relationship between perfectionism and personality]. Stud Educ Psychol. 2005;6(1):81-96. Persian. 33. Thompson JK, van den Berg P, Roehrig M, Guarda AS, Heinberg LJ. The sociocultural attitudes towards appearance scale-3 (SATAQ-3): Development and validation. Int J Eat Disord. 2004;35(3):293-304. doi: 10.1002/eat.10257. [PubMed: 15048945]. 34. Mohammadpanah Ardakan A, Babapour Kheir-ol-din J, Yousefi R. [Validity of Persian version of socio-cultural attitudes towards appearance questionnaire (SATAQ-3) using factor analysis]. Dermatol Cosmetic. 2014;5(1):22-32. Persian. 35. Fisher E, Dunn M, Thompson JK. Social comparison and body image: An investigation of body comparison processes using multidimensional scaling. J Soc Clin Psychol. 2002;21(5):566-79. doi: 10.1521/jscp.21.5.566.22618. 36. van den Berg P, Thompson JK, Obremski-Brandon K, Coovert M. The tripartite influence model of body image and eating disturbance: A covariance structure modeling investigation testing the mediational role of appearance comparison. J Psychosom Res. 2002;53(5):1007-20. [PubMed: 12445590]. 37. Thompson JK, Cattarin J, Fowler B, Fisher E. The perception of teasing scale (POTS): A revision and extension of the physical appearance related teasing scale (PARTS). J Pers Assess. 1995;65(1):146-57. doi: 10.1207/s15327752jpa6501_11. [PubMed: 16367650]. 38. Buhlmann U, Cook LM, Fama JM, Wilhelm S. Perceived teasing experiences in body dysmorphic disorder. Body Image. 2007;4(4):381-5. doi: 10.1016/j.bodyim.2007.06.004. [PubMed: 18089284]. 39. Stice E, Bearman SK. Body-image and eating disturbances prospectively predict increases in depressive symptoms in adolescent girls: A growth curve analysis. Dev Psychol. 2001;37(5):597-607. [PubMed: 11552756]. 40. Garrusi B, Garrusi S, Baneshi MR. Assessment of psychometric properties of Persian version of perceived socio-cultural pressure scale (PSPS). J Pak Med Assoc. 2013;63(4):468-71. [PubMed: 23905443]. 41. Brohede S, Wingren G, Wijma B, Wijma K. Validation of the body dysmorphic disorder questionnaire in a community sample of Swedish women. Psychiatry Res. 2013;210(2):647-52. doi: 10.1016/j.psychres.2013.07.019. [PubMed: 23948660]. 42. Mond JM. Higher BMI, lower self-esteem and more abnormal eating habits are associated with greater body dissatisfaction in adolescents. Evid Based Ment Health. 2012;15(4):104. doi: 10.1136/ebmental-2012-100828. [PubMed: 22789823]. 43. Bailey SD, Ricciardelli LA. Social comparisons, appearance related comments, contingent self-esteem and their relationships with body dissatisfaction and eating disturbance among women. Eat Behav. 2010;11(2):107-12. doi: 10.1016/j.eatbeh.2009.12.001. [PubMed: 20188294]. 44. van den Berg PA, Mond J, Eisenberg M, Ackard D, Neumark-Sztainer D. The link between body dissatisfaction and self-esteem in adolescents: Similarities across gender, age, weight status, race/ethnicity, and socioeconomic status. J Adolesc Health. 2010;47(3):290-6. doi: 10.1016/j.jadohealth.2010.02.004. [PubMed: 20708569]. [PubMed Central: PMC2923488]. 45. Sheffield JK, Tse KH, Sofronoff K. A comparison of body‐image dissatisfaction and eating disturbance among Australian and Hong Kong women. Eur Eat Disord Rev. 2005;13(2):112-24. 46. Phillips KA. Body dysmorphic disorder: The distress of imagined ugliness. Am J Psychiatry. 1991;148(9):1138-49. doi: 10.1176/ajp.148.9.1138. [PubMed: 1882990]. 47. Karazsia BT, Crowther JH. Social body comparison and internalization: Mediators of social influences on men's muscularity-oriented body dissatisfaction. Body Image. 2009;6(2):105-12. doi: 10.1016/j.bodyim.2008.12.003. [PubMed: 19244001]. 48. Buote VM, Wilson AE, Strahan EJ, Gazzola SB, Papps F. Setting the bar: Divergent sociocultural norms for women's and men's ideal appearance in real-world contexts. Body Image. 2011;8(4):322-34. doi: 10.1016/j.bodyim.2011.06.002. [PubMed: 21775228]. 49. Rajagopalan J, Shejwal B. Influence of sociocultural pressures on body image dissatisfaction. Psychol Stud. 2014;59(4):357-64. doi: 10.1007/s12646-014-0245-y. 50. Schaefer MK, Blodgett Salafia EH. The connection of teasing by parents, siblings, and peers with girls' body dissatisfaction and boys' drive for muscularity: The role of social comparison as a mediator. Eat Behav. 2014;15(4):599-608. doi: 10.1016/j.eatbeh.2014.08.018. [PubMed: 25218358]. 51. Weingarden H, Renshaw KD. Body dysmorphic symptoms, functional impairment, and depression: The role of appearance-based teasing. J Psychol. 2016;150(1):119-31. doi: 10.1080/00223980.2015.1012144. [PubMed: 25706778]. 52. Hartmann AS, Thomas JJ, Greenberg JL, Matheny NL, Wilhelm S. A comparison of self-esteem and perfectionism in anorexia nervosa and body dysmorphic disorder. J Nerv Ment Dis. 2014;202(12):883-8. doi: 10.1097/NMD.0000000000000215. [PubMed: 25390930]. 53. Buhlmann U, Etcoff NL, Wilhelm S. Facial attractiveness ratings and perfectionism in body dysmorphic disorder and obsessive-compulsive disorder. J Anxiety Disord. 2008;22(3):540-7. doi: 10.1016/j.janxdis.2007.05.004. [PubMed: 17624717]. 54. Higgins ET. Self-discrepancy: A theory relating self and affect. Psychol Rev. 1987;94(3):319-40. [PubMed: 3615707]. 55. Fitzsimmons-Craft EE, Harney MB, Koehler LG, Danzi LE, Riddell MK, Bardone-Cone AM. Explaining the relation between thin ideal internalization and body dissatisfaction among college women: The roles of social comparison and body surveillance. Body Image. 2012;9(1):43-9. doi: 10.1016/j.bodyim.2011.09.002. [PubMed: 21992811].